Google Services are very essential to our everyday activities on the internet, almost everybody in one way or another use some Google services like Gmail, web search, maps, Google Drive, Google+, Youtube, Google Play etc. Some of us are simply what I consider Google power-users as we heavily rely on several Google services to carry out our every day task on the internet. I am definitely one of such people you could classify as Google Power-users because I use several Google services every day. But then, if you belong to this group you will understand the need to have all Google service at one place. Black Menu for Google is a Chrome extension that contains all Google services at a place. With Black Menu for Google you can easily and quickly search almost everything Google is capable of and gain easy access to the most commonly used Google services, available at any time. Black Menu for Google is a replacement for the removed iGoogle and Google menu and it contains the shortcuts to the most widely used Google services. When you click on any of the services it will open the corresponding Google service in a new tab. After installing the Black Menu for Google, the icon will appear next to the settings menu on your Google Chrome. When you click on the Black Menu for Google button, a slide down menu will reveal all the Google services sorted into categories for your convenience. Hovering your mouse cursor over any of the categories will reveal the menu items and features of that service and on moving away will fade it away. 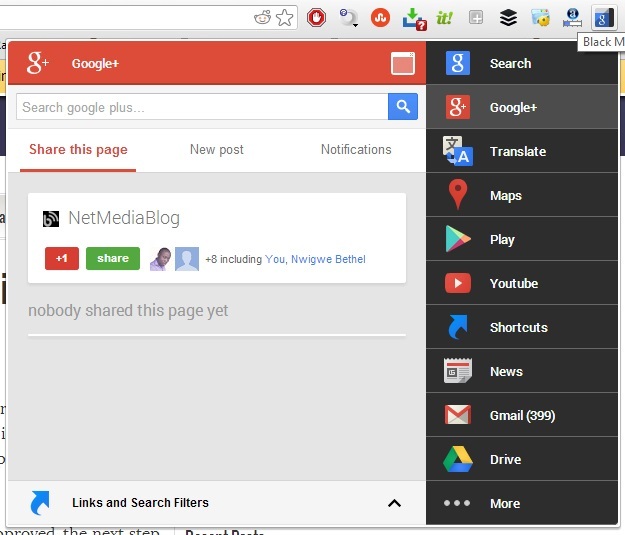 You can easily access all your favorite Google services like web searches, search Youtube, check your Gmail and even access your Google+ social media account right from within the Black Menu for Google. So if you are one of those who heavily rely on Google services the Black Menu for Google is a must have Chrome extension for your browser. It will make your life easy as you won’t have to leave your task to go and check your Gmail or even respond to notifications on your Google+ social media account. Install Black Menu for Google right now on your browser and tell me your experience with it. What feature do you find most interesting? What is the likeliness that you will recommend this extension to someone? Let me hear your views through the comments. That’s an awesome Google chrome extension Nwosu. I would love to try it for sometime as I’m a big fan of Google and its services. I use a lot of services such as Gmail, Google+, Blogger etc. I depend on Google services for every small things…. Thanks for sharing the information!!! Excellent breakdown buddy. I would suggest Black Menu in a second; Google plays a big part in any blogger’s life and Chrome seems to be a browsing master of working in easy to download, helpful plug ins. Right now I use Hootsuite and Alexa apps; might have to add this one to my weapons cache. Another helpful, time-saving post here Nwosu. Keep up the great work and enjoy your day! Its specifically for Chrome. Chrome is the world’s favorite browser maybe you have to switch like i did. That surely sounds like a very wonderful idea. Can we add our Analytics and Webmasters account to it as well? Nice post here for Google lovers, really a great idea to use all the google products at one. Thanks for sharing this great idea. Thanx for telling all about all Google Services at one place. I think that your article was awesome . Once Again Thanx for Publishing so much informative Post. Certainly an essential Chrome extension, but I think it’s not available for firefox… I generally spend lot of time surfing on firfox, if it would be available in firefox that would great.